If you have ever been confined to a wheelchair, or tried carrying your belongings while both hands are needed to properly use your walker, you will understand how important it is to have an easy and convenient way to bring these belongings along safely. 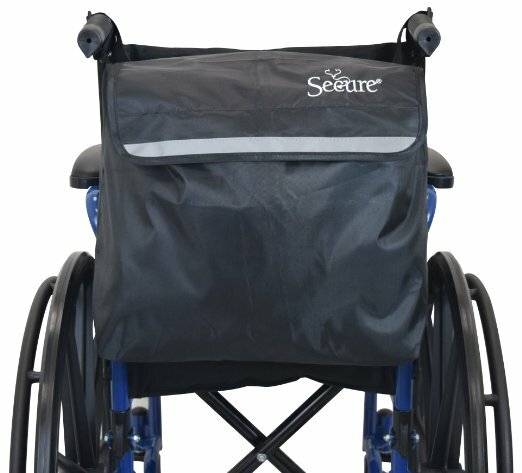 Whether you or a loved one uses a wheelchair, walker, scooter, rollator or other similar aid, the Secure Mobility Storage Backpack w/Reflective Strip & Adjustble Straps is quick and simple to attach to any of these using adjustable mounting straps with dual easy release buckles. It is easy to attach and remove the bag, and keeps your belongings readily at hand. The main compartment is quite large and can easily carry a change of clothing or other needed items, keeping everything you need close at hand. I found this to be quite useful both for my own needs after an injury, and while assisting a friend who was unable to walk unassisted.